Delicious, quality food isn’t Whole Foods Market’s only secret recipe for success – their reputation for an excellent customer experience is now improved with portable technology. Stores located in the Rocky Mountain region recently adopted the use of Apple iPad mini devices to streamline and enhance local promotional planning, social media interactions and customer service. To safeguard their tablets, Whole Foods Market- Rocky Mountain trusts OtterBox protection. There are currently 32 Whole Foods Market locations in the Rocky Mountain region, and while the company’s grocery stores can be found across the U.S., every region and store is empowered to serve their communities with an individual, localized approach. Each store has a dedicated in-house marketer and graphic artist to create a tailored, local feel. Marketers are given a wide array of responsibilities for each store. Beyond taking pictures and notes in the store, the iPad mini allows Whole Foods Market employees to communicate with coworkers easily and engage with customers in a timely manner. To stay organized and productive, Whole Foods Market uses the Evernote app, a platform where information is shared across devices, allowing marketers to review updated training material and share notes with other employees. For Sari Schauer, marketing team leader at Whole Foods Market in Fort Collins, Colo., Evernote is used to keep track of the different promotional material displayed in the store and to start planning with her graphic artist on the next campaign. “It’s a great tool for me to be on the floor, getting creative and then communicating that information right to my graphic artist,” Schauer said. Marketers also take advantage of Twitter, Instagram, Foko and Facebook on their iPad minis. Mission: With great courage, integrity and love – we embrace our responsibility to co-create a world where each of us, our communities and our planet can flourish. All the while, celebrating the sheer love and joy of food. Taking their iPad out on the job may mean endless possibilities for business, but it also means myriad scenarios for dropping and damaging the tablet. 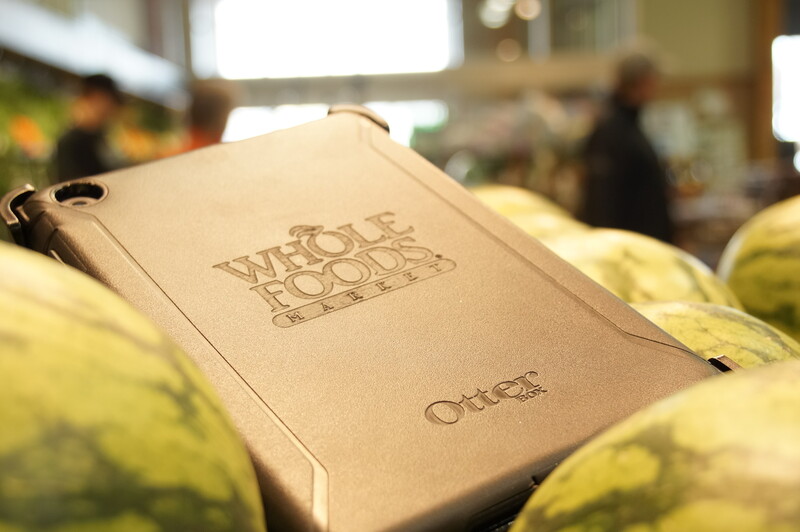 For this reason, Whole Foods Market Rocky Mountain region deployed iPad mini devices with OtterBox Defender Series cases for premium protection. The Defender Series for iPad mini is perfect for this kind of unpredictable environment with rugged, multi-layered protection that guards against drops, scratches and dust while maintaining an unencumbered user experience. It is designed with a polycarbonate inner shell with a built-in screen protector and a robust rubber outer slip cover, which helps to absorb impact. Megan O’Connor, a marketing specialist for Whole Foods in Boulder, Colo., feels that the Defender Series give marketers confidence with their iPad minis, allowing them to do more without fear of damage. Beyond protection, OtterBox Defender Series cases allow Whole Foods Market to distinguish the tablets as a business tool. Marketers for Whole Foods know that friendly face-to-face interactions with customers are a top priority, which is why Scott was determined to keep tablet use professional by working with OtterBox to customize their cases. With continuous growth and new ways to explore technology integration, the marketers at Whole Foods Market Rocky Mountain stores are open to expanding the customer conversation beyond the four store walls by coming together as a team and searching for even more ways to use their iPads, now with the freedom of OtterBox protection.